June is becoming one month to remember when it comes to the mobile industry as we've just witnessed the HTC EVO 4G kick start the summer as being one of the most highly prized Android handsets to become available to date. Closely following its launch, Apple officially unveiled the iPhone 4 during WWDC 2010, where we experienced the biggest overhaul to the handset since it first came to fruition back in 2007. Even though we're just weeks away before the inevitable launch, we shouldn't forget that the iPhone 3GS still clings to life and will remain relevant for quite some time, as it will receive support from Apple in the form of a full-featured iOS 4 update. 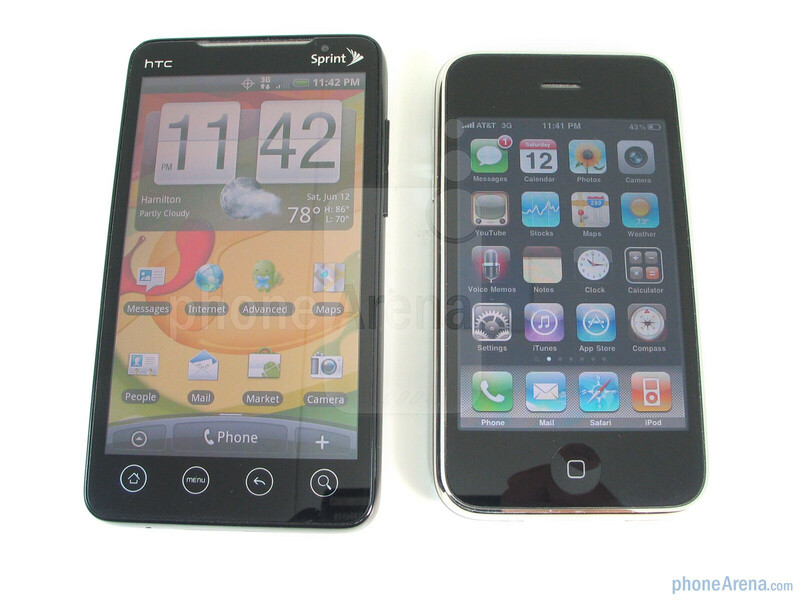 So, while we are waiting to get our hands on the iPhone 4, we'd like to pit these two existing handsets, the HTC EVO 4G and Apple iPhone 3GS, and see how do they stack up against one another. Seeing that touchscreen only handsets have become quite prevalent over the course of the last couple of years, it's no wonder why the HTC EVO 4G's display easily sticks out among the current crop. Not only does it sport a massive 4.3” WVGA TFT display that offers plenty of real estate for the fingers, but it's detailed enough to view the finest of text on-screen. However, its support for 65k colors still manages to mystify us as most high-end smartphones receive a decent treatment in this area. When set on the highest brightness, we were still able to see what's on-screen in direct sunlight. Conversely, the iPhone 3GS's 3.5” HVGA LCD display may be under-sized versus newer handsets out on the market, but it continues to amaze us that it's one of the few phones that implement an oleophobic coating which makes it look pristine every time we take it out of our pockets – something that's much appreciated when smudges and finger prints can take dirty up the EVO's large screen. 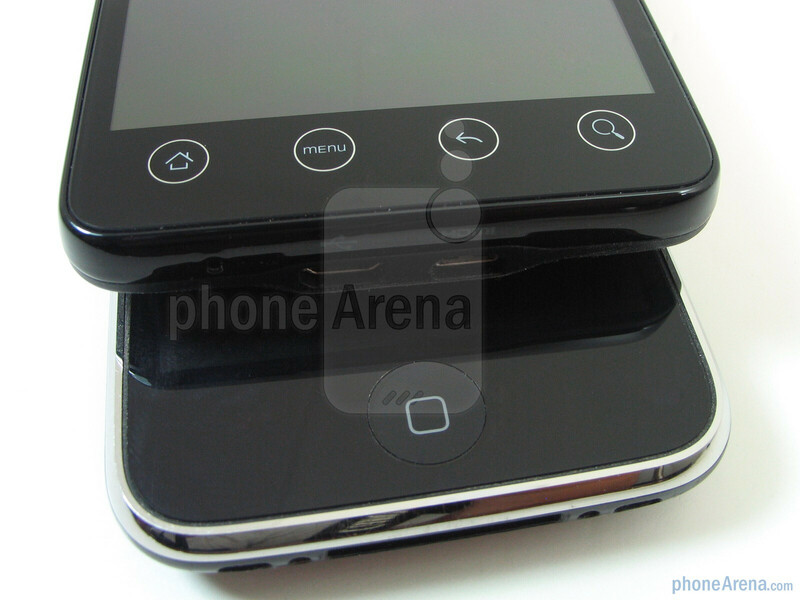 In addition, the glass material used to cover the display feels more durable and we believe it to stand up better over time versus the HTC EVO 4G. And finally, just like the HTC EVO 4G, the iPhone 3GS handles well in outdoor conditions when the sun is beating down directly on the handset – the display was more than visible even in various angles. 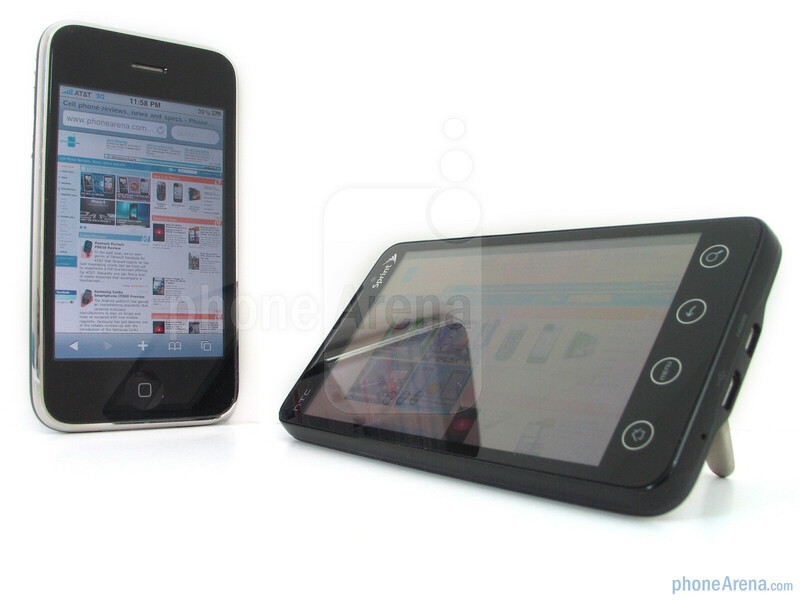 The larger display on the HTC EVO 4G is naturally accompanied with an equally gargantuan shell that manages to pack all of its impressive hardware without compromising much in terms of thickness. 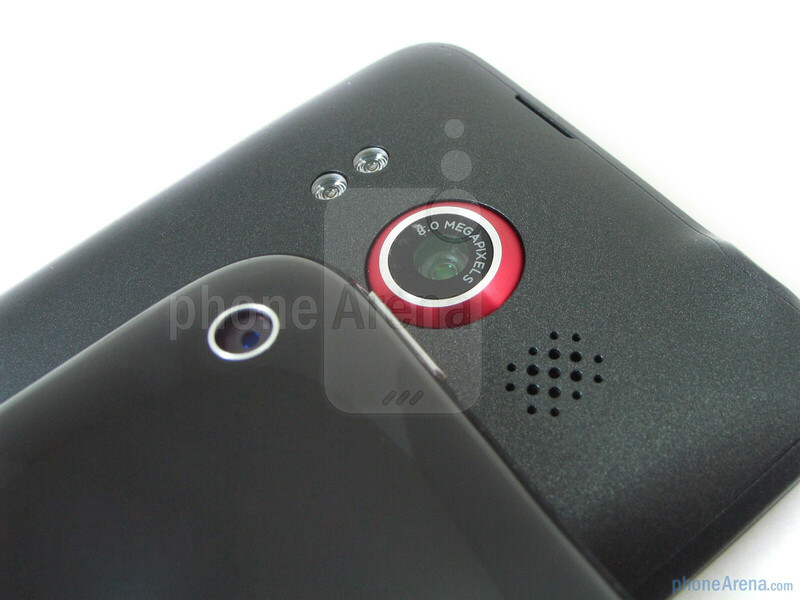 From afar, the stream lined approach does make it quite appealing, but individuals with smaller fingers may find the HTC EVO 4G rather bulky and unwieldy. Needless to say the iPhone 3GS's dimensions are a bit more compact and fit perfectly in the pocket without taking up much room. On the flip side, people with larger hands will naturally gravitate to the EVO 4G as the iPhone may feel a bit too cramped for their tastes. 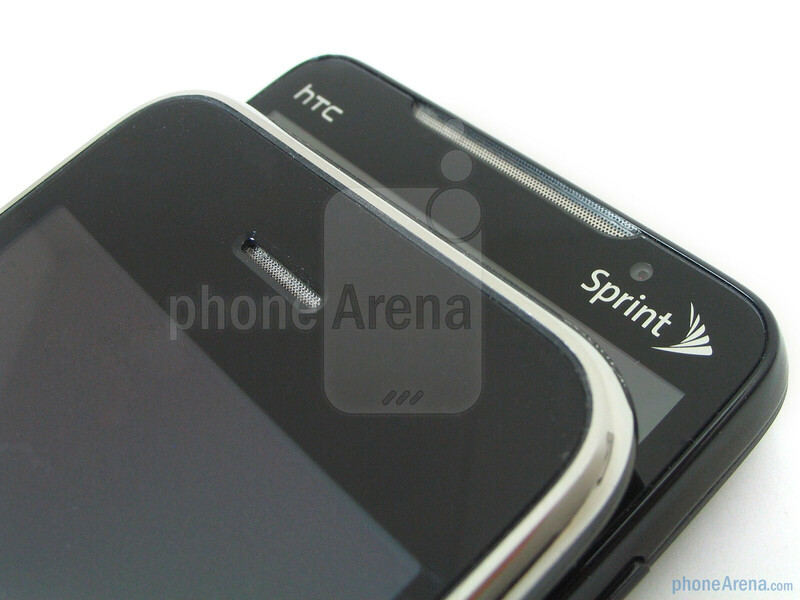 Both handsets utilize interesting designs that substantially catapult them ahead of others, but they are unique enough to the point the fine lines that separate them. On one hand, HTC's usual industrial design continues to set forth its presence on the HTC EVO 4G as it perfectly balances some hard lines and touch sensitive buttons with its completely black exterior. As usual, the soft touch feeling material used for the rear of the phone perfectly accents its overall charm as it retains a clean look and repels additional dirt to muddy its spot-on appearance. 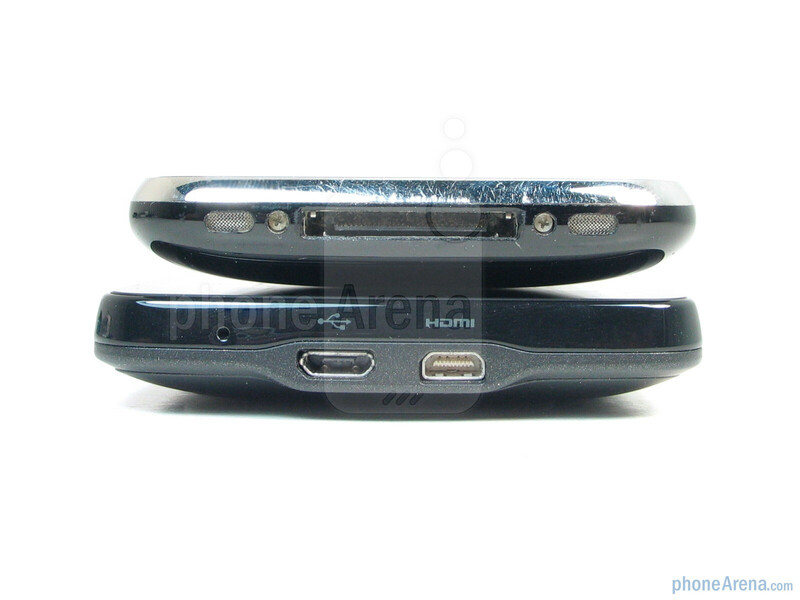 Additionally, the hinge assisted kickstand remains to be one feature that makes it more compelling than the iPhone 3GS, solely due to the fact users can sit back and place themselves in a comfortable position to watch something. Aside from that, the only other thing to jut out from the rear is the 8-megapixel camera that's slightly elevated higher than the rest of the handset – although it may not pose too much of an issue, the thought of the lens resting squarely on unforgiving surfaces is always in the back of our minds. 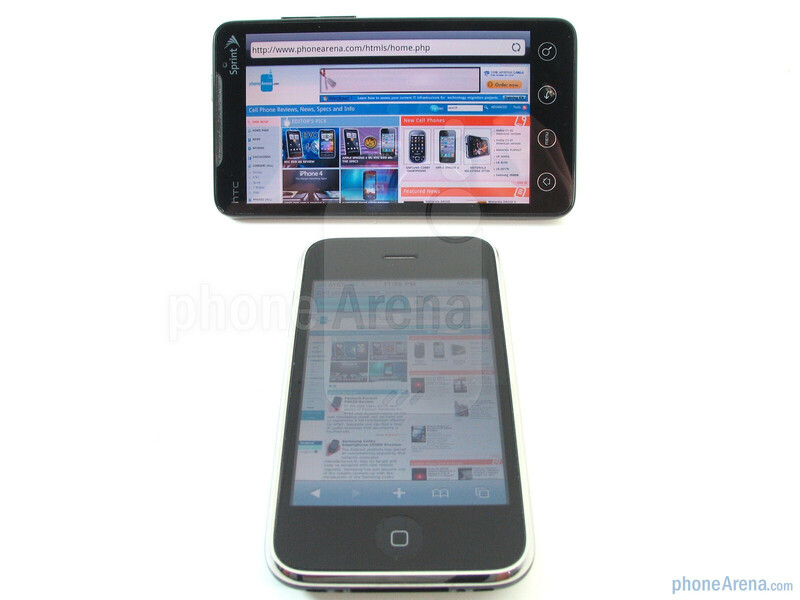 Although the iPhone 3GS has the ability to output video with a proprietary cable, the HTC EVO 4G's inclusion of a micro HDMI port will easily be seen as a strong backing for individuals intent on sharing content on the big screen. Seeing that the Apple iPhone 3GS remains relatively unchanged from the previous 3G model, it still manages to enchant consumers with its quality design and construction that pierces the hearts of many. We still adore the fact that the chrome bezel elegantly accents the device – giving it that jewel like luster that radiates ever so gracefully in the sun's rays. 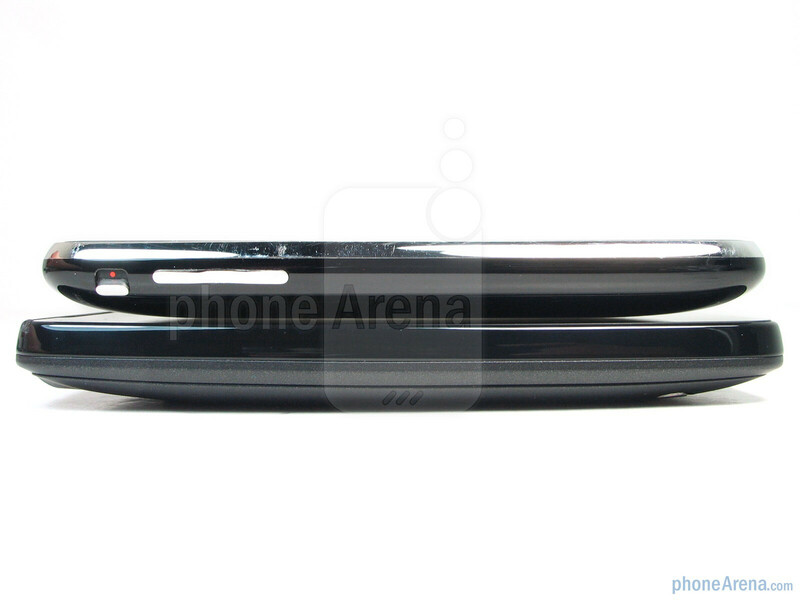 The Apple iPhone 3GS feels a bit more natural in the hand with its curved rear that allows us to hold it perfectly still. Material-wise, some may lament knowing that glossy plastic is used entirely for the rear, but confidence is restored once you feel its tough nature. The only downside to its plastic rear is that it's a bit more prone to scratches and smudges, however, uniformity is preserved as there are no indentations or bumps sticking out. One would be led to believe that the handset is light weight, which it is when compared to the HTC EVO 4G, but the premium materials in use make it feel a bit heavier than other comparably sized handsets. 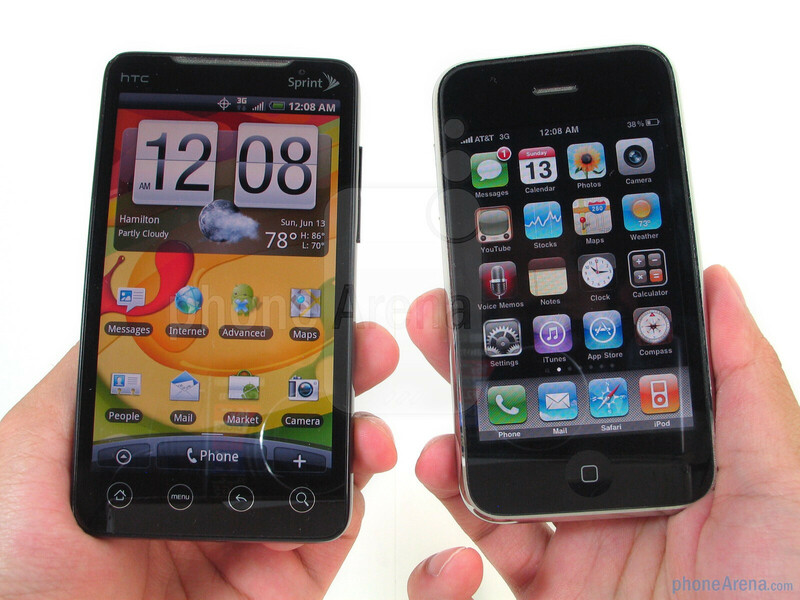 There's no arguing that both handsets are quite appealing – especially for the HTC EVO 4G with its fresher looks. At the same time, the quality and experience of its display is unmatched as every nook and cranny is filled with plenty of detail. 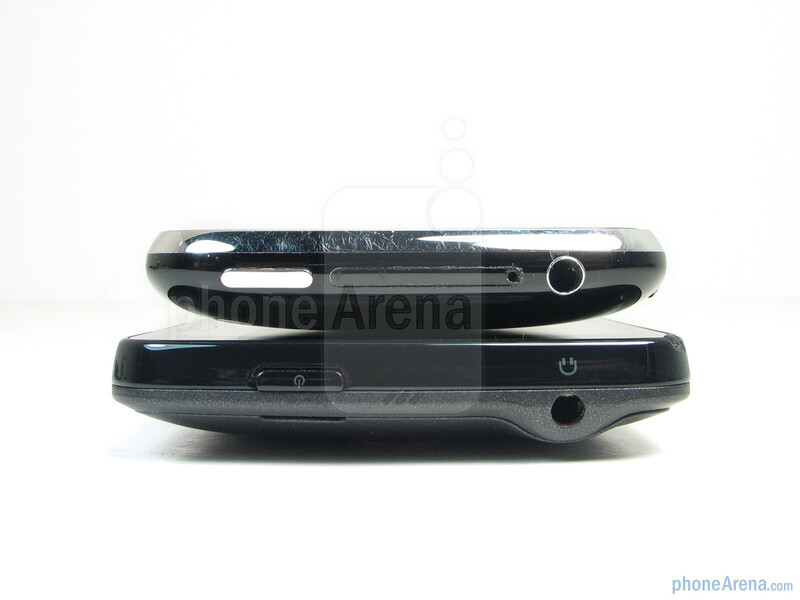 It's not to say that the iPhone 3GS doesn't stand tall in the same category, but as it continues to sport the same HVGA display found on the original, there is little doubt that it gives some leeway to the competition. As with anything newer, the HTC EVO 4G virtually improves on many aspects that were seen impressive by the iPhone 3GS, but it happily takes it to the next level with features rarely seen in the US market like the kickstand, front facing camera, micro HDMI port, and a larger than life display. 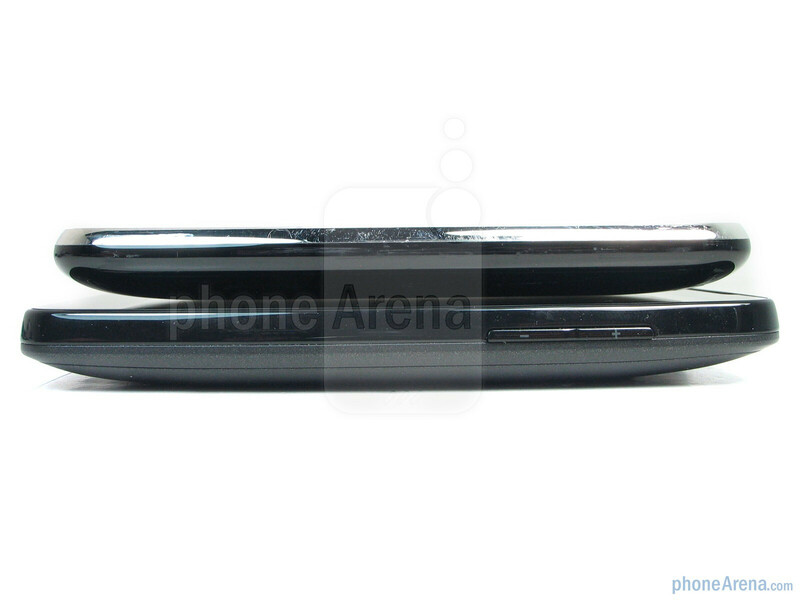 Somebody asked for it in the Droid Incredible vs EVO 4G comparison, and now PhoneArena did it.. I figured it wouldn't make sense to be comparing the EVO to the 3Gs but I guess some people still want it anyway so whatever. Waiting for the iPhone 4 comparison.